Do you need help with something ? 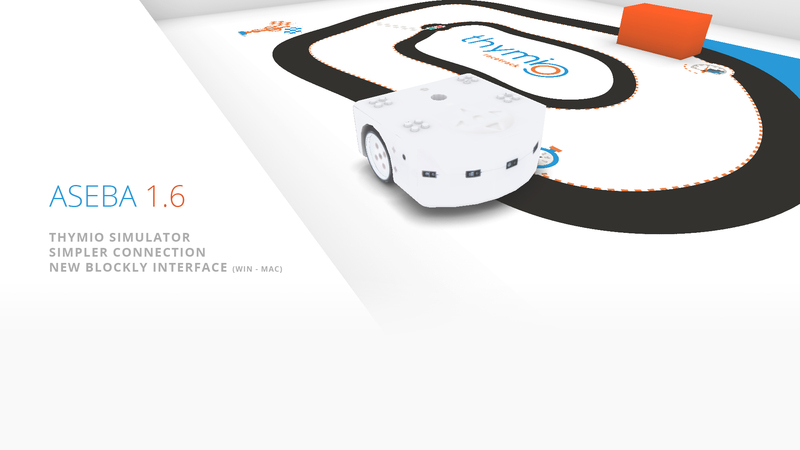 You can now try Thymio with a simulator, program Thymio with Scratch and the new Blockly interface, also, this update correct disconnection issues with Windows 10.
how to use Thymio with 30 fun activities. Comment démarrer avec @ThymioII : présentation générale en vidéo, explication des comportements, programmez, rechargez, réglez..
You can use the following images for your communication and for product descriptions. How to be a partner of Mobsya ? Show the world that your company cares about digital education and take the opportunity to organize amazing things with Thymio. Do you have interesting information to share ? Mobsya association is taking care of Thymio communication and social medias. You can send us pertinent information about Thymio (Events, free workshops, user stories, tutorials, Thymio products reviews, …) that we will share. We want to give followers and users useful information about how to use the robot, about what you can do with the robot and about other user’s/partners feedback. We will not share any advertising like, for example, a special offer on Thymio products.